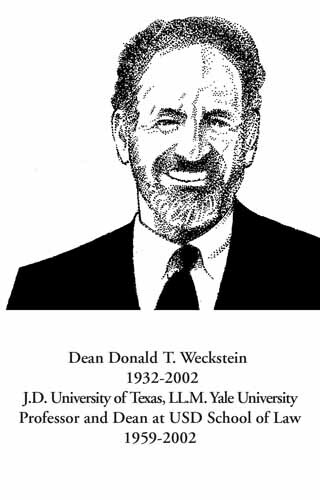 For more than 30 years Donald Weckstein was a Professor and Dean of law at the University of San Diego School of Law. He began his career with USD in 1972 taking over the helm of the Law School as Dean where, among his many accomplishments, he was named the inaugural University Professor for the School of Law in 1994. Dean Weckstein’s love for academia began with his own education when he received his B.B.A. from the University of Wisconsin in 1954, followed by his J.D. from the University of Texas in 1958, and his LL.M. from Yale University in 1959. He went on to distinguish himself as a teacher and scholar while continuing his other academics pursuits authoring numerous law review articles, books and amicus curiae briefs. He was known for his work on legal ethics and alternative dispute resolution, and was an active member of the National Academy of Arbitrators and the Society of Professionals in Dispute Resolution. Among the numerous awards Dean Weckstein earned were the Bernard E. Witkin award for civic leadership and excellence in teaching, practice, enactment or adjudication of the law; and the Robert C. Barrett Award for outstanding service to the California Dispute Resolution Council for contributions in the field of arbitration. He served in the Judge Advocate General Corps of the U.S. Army, he remained active in the Army reserve until his retirement as full Colonel in the JAG Corps reserve. He was known as an active and vigorous man, with a keen and deep intellect, sharp wit, generous and friendly nature and a ready smile. He is survived by his wife Linda; son Zachary; and three daughters Elizabeth Furman, Alyson Weckstein-Lou, and Julie Weckstein.